12.15.2007 - Raccoons are opportunistic creatures who love to live in urban areas and neighborhoods. They take advantage of any space they can find a good, dry, safe home. Trees are in short supply, but houses aren't! Many homes have raised decks or are elevated with crawlspaces underneath. Many wild animals are attracted to such areas, which are protected from the weather. It's common for raccoons to choose to set up shop under the house. 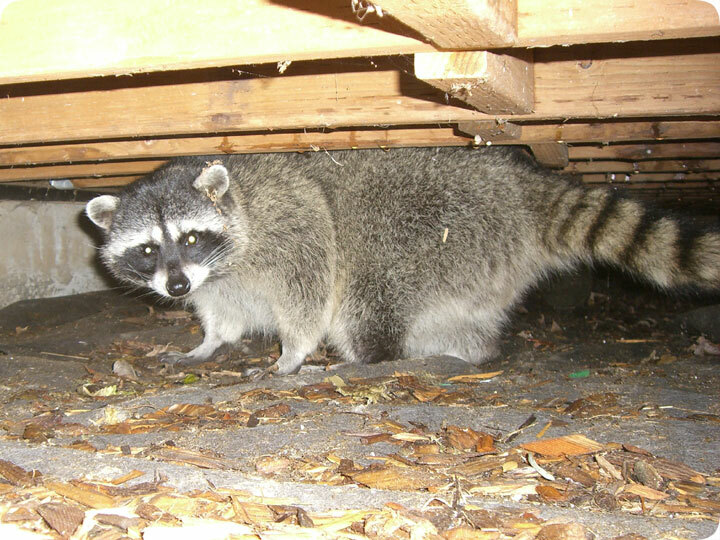 Most of the raccoons under homes are solitary raccoons, or males. Female raccoons who have young like to live far off the ground, and so they will crawl to the roof and break into the attic. But a raccoon under a house is likely a male. They can't cause as much damage under a house as in an attic, but if you have any ducts or wiring under the house, the raccoons will often tear it apart. I've also seen many cases in which raccoons die underneath homes, and the stench is unbearable. Raccoons also commonly carry fleas, and if the raccoon is underneath your home, the fleas may spread to your or your pets. Many people simply want me to trap the raccoon living under their house or porch because it makes noise, they frequently see it, and they are afraid for the safety of pets. Raccoons living in or around any part of a house are also likely to tip garbage cans or eventually work their way into the attic. I humanely trap and remove raccoons, and relocate them far away. After the raccoon(s) are out, I can seal off the entry points leading under the home, so that no more racccoons get in again.